Transcript of yesterday’s entry for The Dog Days of Podcasting. Transcript may not match final recording. Listen to the episode at The Bathtub Mermaid. 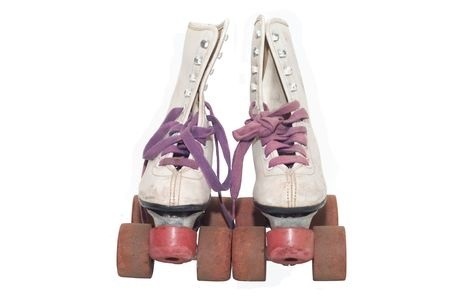 The first time I heard the word “polyurethane” I was nine years old, and begging my mother for new roller-skates – the kind that have the smooth wheels like the rental skates at the rink. It must have been around my birthday, or maybe Christmas. Shortly afterward, I received a pair of roller-skates with white leather booties sporting blue stripes, and happy reddish-pinkish polyurethane wheels. Every day after school, every Saturday after the usual cartoon hour (which I never watched), I would walk sideways down the three floors from our condo to the ground, holding onto the rail so I wouldn’t roll off the edge of a step. My daring friends and I would skate in the local park, racing down the steep hill and across the low bridge over the creek, and then up the gentle slope on the other side. We never missed the sharp turn onto the bridge, or went careening off the unprotected edge, but sometimes we almost did. Sometimes I think we secretly wanted to. The most recent occurrence of the word “polyurethane” in my life was earlier today, when our hired contractors sanded our kitchen cabinets and painted them with a coating of the stuff. I’m convinced the fumes have made me slightly high. I’m also convinced nothing was as awesome as being nine years old, and roller-skating down a steep hill and across a bridge.